A few winters ago, my family and I checked into a restored 17th-century estate in the tiny town of Lower Monferrato, in Piedmont, Italy. Our bay window looked out onto rolling hills covered in grapevines and, far, far in the landscape, the snow-topped Alps. No cars passed the cypress-dotted landscape; each morning we sat down in total tranquility to a breakfast of fresh-baked bread, soft cheeses, and blood orange juice. The experience was one that many modern travelers are searching for: a few nights hidden away in a European village, experiencing the traditional culture and soul of a destination. So for your next European getaway, take a detour to a tiny town. Ullastret, in Spain’s Baix Empordà, is a notable Slow Food mecca: at the four-room Hotel El Fort, owner Lola Puig serves locally grown vegetables, homemade bread, and organic goat's cheese on a lantern-lit terrace that overlooks a field of mulberry trees. Further off the beaten path, in Arild, Sweden, the artist Lars Vilks built Nimis, a public art installation with a maze of 300-foot aboveground tunnels and a 45-foot-high climbing tower. The fishing village itself is just a two-hour drive and ferry ride from Copenhagen. The charm of Ticino, the Italian-speaking canton of southern Switzerland, is the not-quite-here, not-quite-there, lost-in-time feel of the place. To fully appreciate it, drive north 35 miles from the popular lake resort towns of Ascona and Locarno and find the turnoff for Giornico, a stone relic of 14th-century Europe hiding off the main road. Descend into the valley and arrive at a trickling little river crossed by two arching stone bridges. The family-run restaurants of the region are called grotte. The best, Grotto dei due Ponti, serves dishes like spezzatino (meat ragoût) with polenta and tart local Merlot. How to Get There: From the lake resorts, drive north 50 minutes on the A13 and N2. Where to Stay: There are no hotels in Giornico, so stay in nearby Ascona at the pink Hotel Giardino (doubles from $400). Where to Eat: Grotto dei due Ponti has a shaded terrace that overlooks the river. In the fall, a mist settles into the hills surrounding the bay of Kotor, so thick you can hardly see the blood-orange trees in front of you. That hasn’t stopped the tide of wealthy Europeans: British expats are selling real estate, Russians are buying farmhouses in the hills, and the dark-haired, green-eyed people of the Black Mountains (how Montenegro gets its name) have opened restaurants to introduce visitors to the tastes of Montenegrin stewed meat. Beaches are not yet overrun, but this wild side of the Dalmatian Coast won’t stay undeveloped for long. How to Get There: Kotor is 50 miles from Podgorica, the capital. Where to Stay: Palazzo Radomiri (doubles from $143) was built from Croatian stone. Where to Eat: Stari Mlini, on a mountain stream. The Viale dei Cipressi, a three-mile road flanked by over 2,500 cypress trees (the only vegetation local buffalo don’t eat), leads straight into Bolgheri, which is set amid the vineyards of southern Tuscany’s Maremma. There’s more to this village than just the dramatic arrival, however. Stop in at Caffé della Posta, on the main square, to try one of Bolgheri’s reds: first produced in the 1980’s, these wines now rival French Bordeaux. In nearby Bibbona, five miles southeast, you’ll find the Relais Sant’Elena, a 15-room estate with canopy beds, stone fireplaces, and pasta-making classes. How to Get There: Bolgheri is a 40-mile drive south from Pisa. Where to Stay: Relais Sant’Elena (doubles from $182). Where to Eat: Chefs Omar Barsacchi and Gionata d’Alessi serve Tuscan-Maremman cuisine (ravioli stuffed with pappa al pomodoro) at Osteria Magona (Piazza Ugo 2\3, 011-39-0565-762173). This enclave on the edge of the Black Forest, in southern Germany, is the ideal destination for a wine weekend. From Strasbourg, you’ll pass hills covered with terraced vineyards; the statue of a fat, naked Bacchus signals that you’ve arrived at the tiny downtown. Main Street’s pastel houses lead to the market place, which is crowned by the Town Hall, with a gothic inscription relating local history back to 770 on the façade. Join the businessmen in pinstripes at the outdoor wine bar, though a word to overindulgers: legend has it that any reveler who falls into one of the (sparkling-clean) irrigation ditches that run through town is destined to marry a local. How to Get There: Staufen is 75 minutes by car from Strasbourg. Where to Stay and Eat: Hotel-Gasthof Kreuz-Post (doubles from $136) has five rooms in patterned fabrics. Try duck breast, savory mushroom crêpes, and blood-sausage risotto at its restaurant. Local Take: Pick up a bottle of cherry or plum eau-de-vie at the Alfred Schladerer distillery, run by sixth-generation vintner Philipp Schladerer. Lavenham, in Suffolk, may just be the prettiest town in England. It boasts more than 350 heritage houses and its high street is lined with the kind of bric-a-brac shops and teahouses (serving scones and clotted cream) that are on the endangered list throughout rural England—and all but extinct in glossier reaches, such as the Cotswolds and West Dorset. Sarah Townsend, former owner of the superchic Palazzo Terranova, in Umbria, was so charmed by the region that she just opened a small inn in nearby Buxhall. How to Get There: Trains depart London’s Liverpool Street Station several times daily for Stowmarket, 14 miles away. Or, get off at Colchester and take the Chambers 753 bus line into town. Where to Stay and Eat: The contemporary Great House Hotel (doubles from $162) is in Lavenham’s town center. The Great House Restaurant, with its gastropub take on English fare, is one of Suffolk’s finest. The train from Edinburgh stops at a Victorian station next to a riot of neatly planted flowers in a hidden glen in the shadow of a medieval castle. Aberdour is not car-friendly, but why should it be when anything you would want to see is in town and connected by well-kept walkways? In August, this hamlet serves as a tranquil base for visiting the Edinburgh International Festival, but for the rest of the year, it is a working village with a general store, four cozy pubs, and even a shop dedicated to Wiccan supplies, situated provocatively equidistant from the Churches of Scotland and the Scottish Episcopal Church. How to Get There: Aberdour is 30 minutes by train from Edinburgh. Where to Stay and Eat: Great Value The Woodside Hotel (doubles from $140) offers rooms decorated in individual tartans. The bar, whose paneling came from a 19th century passenger ship, serves local Highland beef. In this eastern Umbrian citadel, artisanal culinary traditions endure. Pecorino cheese is aged for two years, trained dogs sniff out black truffles in the woodlands, and honey is sourced from the red wildflowers that bloom in the plains. But it’s the cinghiale that takes pride of place. Throughout the centro storico, the scent of spiced wild-boar salumi carries from the norcineria (delis) into the traffic-free roads. Step past the prosciutti hanging in storefronts to find shopkeepers curing cuts of the pork with methods perfected over the past 800 years. Ask them to slice up fresh ciauscoli, and bring it to the Piazza San Benedetto, where villagers celebrate the Festival of Saint Benedict in the spring. How to Get There: Norcia is 69 miles northeast of Rome. Where to Stay: The 24-room Palazzo Seneca, set in a 16th-century palace. Where to Eat: Il Granaro del Monte, for plates of black-truffle strangozzi pasta. Local Take: Fabrizio Marini, director of the food shop Norceria Brancaleone da Norcia, recommends visiting during the Black Truffle Festival, in February and March. No blackberries could taste better than the ones picked along the winding lanes of Roundstone. But even the berry-averse will find reasons to love this 19th-century fishing village. Climb Errisbeg Hill for a clear view of Connemara National Park’s Twelve Bens: a mountain range rising over a vast peat bog. In case of rain—always in Ireland’s cards—head to Malachy Kearns’s shop, which sells handmade bodhran (Irish drums), or dry off by the fire at O’Dowds bar with a kit (a pint of Guinness and a shot of Irish whiskey). How to Get There: From Galway, it’s a 76-mile drive. Where to Stay: Family-run Cashel House Hotel (doubles from $220), on 50 acres, is just a few miles east of Roundstone. Where to Eat: Join anglers in the bar at Ballynahinch Castle Hotel or at O’Dowds. Several years ago Harry Lester (formerly chef and owner of London’s Anchor & Hope gastropub) and his partner, Ali Johnson, set their sights on France’s Auvergne and bought a thirties-era stone inn in tiny Chassignolles. The village, popular with Marseilles’ elite in the 1950’s, promises dormant green volcanoes and winding streams assumed to have healing qualities. At the restored auberge, guests look out toward the 12th-century Romanesque church and can enjoy inventive meals made from local ingredients. How to Get There: Chassignolles is halfway between Clermont-Ferrand and Le Puy-en-Velay. Where to Stay and Eat: Great Value At the Auberge de Chassignolles (doubles from $58), white rooms are decorated with French antiques. At its restaurant, specialties from Auvergne like pounti (a pork, Swiss-chard, and prune tartine) and tarte aux cèpes are often on the menu, which changes daily. Local Take: Try the meandering, 90-minute walk to Durbiat, an even smaller village with a crumbling castle. The chefs at the auberge will pack up a picnic basket. There’s no mistaking it, this tranquil spot in the Cyclades has nothing in common with neighboring Santorini: no building stands above two stories, no cruise ships pull into port, and there are no boutiques or fancy restaurants. Instead, on this remote island in the Aegean, waves crash on pebbled beaches, goats scurry up the hills, and an old wooden windmill twists in the salty breeze. It’s a delightfully quiet escape for those who have grown tired of Greece’s more trammeled getaways. How to Get There: Fly to Santorini or take a ferry or a hydrofoil from Piraeus, just outside Athens. Where to Stay: Great Value There’s a nautical theme at Anemomilos Apartments (studios from $131), on a cliff with easy access to the village of Hora. Anemi Hotel is a modern newcomer with cube-shaped rooms near Karavostasi port. Where to Eat: Irini’s, a grocery that turns into a restaurant at night, is the place for a home-cooked meal. Were it not for San Sebastián, just 15 miles away, this Basque harborside village might have become Spain’s Next Great Getaway. Instead, the port is known solely for its seafood—baby squid and turbot pulled from the Bay of Biscay and then grilled a la plancha. Prime dining is Saturday and Sunday lunch, when locals fill asadores dressed in creamy summer-weight cashmere (those in white-soled shoes arrived by boat) for that distinctly Spanish indulgence: a leisurely multicourse meal paired with bottles of white Rioja. How to Get There: Getaria is 15 miles west from San Sebastián. Where to Stay: Great Value Saiaz Getaria (doubles from $115), with four-poster beds and views of Gaztetape Beach. Where to Eat: Reserve a table at Restaurante Elkano, one of the most celebrated asadores in Spain. There are dramatic mountainside forts, and then there is Marvão, the king of them all. Located in the southeastern Alentejo region of Portugal, this town is centered around a Moorish castle that was Christianized in the 13th century. The stone complex, now laid open to the elements in a kind of tumbledown glory, sits atop a rocky hill, dominating the red-tile-roofed houses and convents that spill out onto curving streets to the east. How to Get There: By car from Lisbon. Where to Stay: Pousada Santa Maria (doubles from $102), a simple 31-room hotel and restaurant constructed from a foundry and two 13th-century houses. Where to Eat: Fill up on goat soup at the Varanda do Alentejo lunch counter. Though just 85-odd miles from Amsterdam and northeast of Vlieland (nicknamed “Vli-biza” by Amsterdammers), the 18-mile-long island of Terschelling remains a haven for travelers craving tranquil stretches of sand in lieu of the thumping beach clubs on the mainland. Here, gabled 19th-century villas and clapboard houses are illuminated by the Brandaris lighthouse—the oldest surviving lighthouse in the Netherlands (built in 1594). 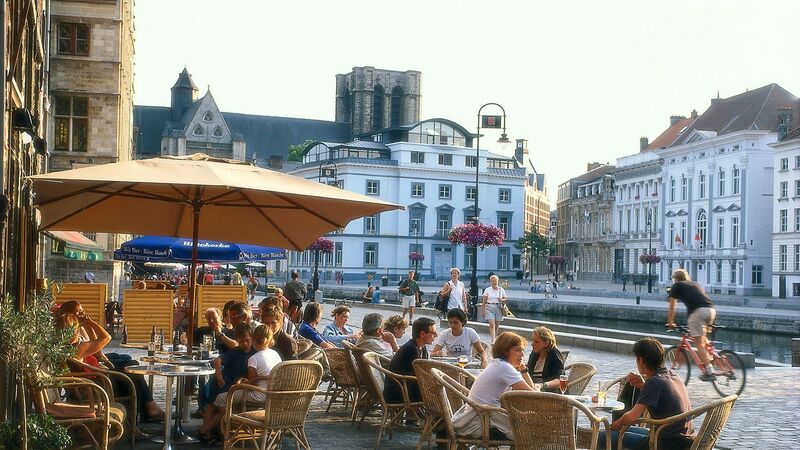 When dusk falls, around midnight during the summer months, locals sit up late at bistros along the harbor drinking Jupiler beer and toasting their exceptionally good fortune. How to Get There: Ferries depart daily March through November from Harlingen and Vlieland. Where To Stay: The three-room Wellness Hotel Caracol, with slick interiors and Hästens beds, is just a block away from the harbor. Where to Eat: De Grië serves seafood on the water. Riding the train from Copenhagen to Tisvildeleje is like taking an 80-minute tour of every corner of Denmark—past suburbs, verdant countryside, and forested woodlands. The journey is well worth it: on the shore of the Kattegat Strait is a quiet seaside village with thatched-roof cottages along sand dunes beside the sea. For those who think that Denmark doesn’t deliver a memorable beach escape, a visit to this sunny enclave will surely change your mind. How to Get There: Take the S-train north from Copenhagen, changing at Hillerød. Where to Stay: Great Value The 24-room Tisvildeleje Strandhotel (doubles from $344) is owned by Danish ballet dancer Alexander Kolpin. Where to Eat: Bio Bistro, a café and movie theater known to stream performances from Europe's premiere opera houses. Though there’s plenty of natural beauty in Arild, a fishing village on a peninsula in southwest Sweden, the town’s most notable site is actually man-made. In 1980 the artist Lars Vilks began nailing together driftwood and lumber in a cove at the bottom of a hillside; he even declared the place an independent country called Ladonia. After police tried to dismantle the work, artists Christo and Joseph Beuys stepped in to protect the installation. Today the public art exhibit, officially christened Nimis, is the Scandinavian version of Los Angeles’s Watts Towers. The maze of 300-foot aboveground tunnels and 45-foot-high climbing towers feels like an alternate—albeit somewhat unsturdy—universe for intrepid explorers. How to Get There: The trip is a two-hour drive plus a ferry ride from Copenhagen. Where to Stay and Eat: Great Value The 17th-century Hotel Rusthållargården has a restaurant that serves egg cake with lingonberries. While the remnants of the fishing sheds built by Hellnar’s 11th-century settlers may suggest that this town hasn’t changed since the Vikings arrived, it is, in some ways, the most contemporary village in Iceland. The handful of residents—all of them small-boat fishermen—share a serious commitment to preserving the environment. Houses and farms in Hellnar, located at the far end of a peninsula facing the Snaefellsjökull glacier, are heated by eco-friendly hydroelectric power, and Hotel Hellnar was the first hospitality venture in the country to be certified by Green Globe, the international sustainability certification system. How to Get There: Fly into Keflavík International Airport and drive 3 1/2 hours to Hellnar. Where to Stay and Eat: Hotel Hellnar or Hotel Budir, a luxury property on a farmstead that serves a rotating ment of freshly caught fish. Local Take: In summer, you’ll find Gudrun Bergmann, owner of Hotel Hellnar, on the top of the glacier with Snjofell Tours. During 41 years of Communist rule, Slavonice, halfway between Prague and Vienna, was too close to the Iron Curtain for the government’s comfort. But since the Velvet Revolution in 1989, this off-the-radar hamlet—composed of two town squares and burgher houses painted with Renaissance-era graffiti of biblical scenes—has attracted painters and potters from Prague looking for refuge. We’re not betting that this village will become a mini Berlin, but British-born architect John Lifton’s Slavonice Institute, a center for art and progressive thought, may put the village on the art world map yet. How to Get There: Slavonice is a two-hour drive south of Prague. Where to Stay: Spare interiors were designed by artists at Besídka (doubles from $70). Where to Eat: Alfa serves goulash and dumplings in a late-Gothic building. Local Take: Jan Bohac, owner of Besídka, recommends visiting the village’s 12th-century tunnels. As fishing villages go, the whitewashed cottages and tidy tearooms of St. Mawes, in southern Cornwall, feel like a stage set. In this quiet backwater, fishermen sell their catch on a quay, and in the evenings, you will find them drinking Cornish-brewed Betty Stogs ale while playing snooker at the St. Mawes Billiards & Social Club. Visitors settle into the upper deck at Hotel Tresanton for posh Pimm’s Cup cocktails with the seafaring crowd. How to Get There: St. Mawes is a five-hour drive southwest of London. Where To Stay: Hotel Tresanton (doubles from $395) overlooks the cove and has a boat for exploring Falmouth Bay. Where to Eat: The ploughman’s lunch at Café Chandlers is a must; save room for a raisin-studded scone. Local Take: Go to Waterside Gallery for a selection on local artists' work. The Périgord, in the Dordogne, is home to two of France’s most coveted delicacies: foie gras and truffles. On market days in the tiny village of St.-Geniès, two hours east of Bordeaux, shoppers tote wicker baskets to the town square, where apron-clad vendors hawk pommes salardaises (potatoes sautéed in duck fat and garlic) and saucissons rolled in herbs. How to Get There: Take the A89 from Bordeaux. Local Take: A bike ride in the countryside is the best way to work off the region’s famous foie gras. If you’ve heard murmurs that the jagged mountains and white-sand beaches of the Mani region are worth the trip from Athens, you’re not alone. Insiders head there for a traditional experience: authentic Greek salads and moussaka at Lela’s Taverna before spending the evening at the Elies Hotel’s outdoor patio, which overlooks the Gulf of Messenia. About three hours away on the Ionian Sea is the 765-room Costa Navarino resort with an observatory and tourism office dedicated to sustaining the village’s community and seafront. How to Get There: Fly to Athens, then drive three hours south through the Peloponnese to the Mani. Where to Stay: Elies Hotel (doubles from $155) has 10 rooms and maisonettes set within olive groves. On the hillside, Notos Hotel (doubles from $129) has 14 simple apartments with views of Ritsa Beach. Where to Eat: Lela’s Taverna for Greek home-cooking. Spain’s Baix Empordà region is chock-ful of authentic towns, but local foodies have a favorite destination: Ullastret, home to El Fort, a restaurant and hotel run by Lola Puig. She has transformed the homey restaurant her parents ran for many years into a Slow Food temple. Her menus feature specialties like organic house-made goat's cheese and black rice with cuttlefish. From the lantern-lit terrace, diners look out onto the Mediterranean just a few miles east. How to Get There: Ullastret is 80 miles northeast of Barcelona and 20 miles east of Girona. Where to Stay and Eat: Hotel El Fort (doubles from $130, including breakfast) has four airy, affordable apartments and includes a breakfast of country bread with tomato. Local Take: Puig thinks the best view of the region is from the air, seeing the sun rise above Iberian ruins from a hot-air balloon (Globus Empordà). Take a 10-minute commuter train from Innsbruck straight into what feels like the Middle Ages. Hall in Tirol, established in 1303, has remained unusually intact thanks to the medieval embankment and the area’s wealth from salt mining and minting. (Ample cash flow meant that the buildings were constructed from the finest materials.) But the allure comes from the surroundings: the Alps, with hiking and ski trails galore. How to Get There: Hall in Tirol is a 20-minute drive from Innsbruck. Where to Stay: Schlosshotel Goldener Engl (doubles from $208) balances stately grandeur with Alpine kitsch. Where to Eat: Pipistrello, a wine-and-schnapps bar. In this Estonian island hamlet—once a Swedish feudal territory—the local trades of fishing and shepherding have left the surrounding wilds untouched by large-scale agricultural development. Visitors can still catch glimpses of wild goats, fox, deer, moose, and—in spring—migrating swans; or head to the 60-foot Üügu Cliff to ogle over 20 species of orchids. How to Get There: Ferries depart on the hour from Virtsu for Kuivastu, on Muhu Island. Where to Stay and Eat: The 24-room Pädaste Manor (doubles from $380) has the island’s finest Nordic restaurant. Local Take: In July, nearby Nautse village hosts a jazz festival. When Russian oligarchs head to the country, they go to Plios, on the banks of the Volga. Since 1999 Alexey Shevtsov, a tycoon turned hotelier, and his wife, Natalia, have been converting the town’s provincial buildings into dacha-style guesthouses. Thankfully Plios hasn’t lost its original Slavic appeal: the scent of woodsmoke wafts from Russian stoves, men hawk smoked Volga bream, and babushkas carry baskets of chanterelles past old merchant’s houses. How to Get There: Hire a car service from your hotel in Moscow for the four-hour drive northeast. Where to Stay: Shevtsov’s hotel group runs the rustic-moderne Fortecia Rus Hotel (doubles from $67; apartments from $165). This Saxon village got a lucky break when it became the beneficiary of the Mihai Eminescu Trust, a nonprofit overseen by Prince Charles that’s devoted to protecting the heritage of Transylvania’s country towns. In Viscri, that means the church and its cemetery (which dates back to the 12th century) is now a UNESCO World Heritage site. Indigenous pear trees were replanted, the lone blacksmith has a new shop, and a new road along the pastel-colored brick houses and farms provides visitors—and the philanthropic elite—a glimpse into the authentic Saxon way of life. How to Get There: Drive four hours northwest from Bucharest. Where to Stay and Eat: Try the MET Guesthouse, with a 200-year-old Saxon bed, a cabinet with a pullout mattress. The owner will serve a home-cooked meal of mămăliga (cornmeal porridge).